My desk is in a walk-in closet, which I use as an office. However, until January it still functioned as a cluttered closet in addition to being an office. A friend designed a shelving system for me and did the remodel work. That’s still not quite finished, as I need to replace the ceiling light. Photos once I do that. As part of decluttering and reorganizing, I’ve been purging stuff so I can make better use of my space. I reached a big milestone today. 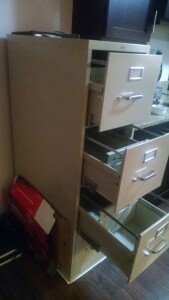 I have a four drawer filing cabinet (photo on left), three drawers of which were completely filled with old paperwork of mine. Over the last month, I’ve looked through every piece of paper in those three drawers. What I needed, I scanned. What I didn’t, got tossed straight away. Removing what I didn’t need to keep in physical form turned 75 linear inches of paperwork into 5 (photo on right). Half of that is for the purchase of my condo, which includes a voluminous resale certificate . I still have purging to do, but this was huge. 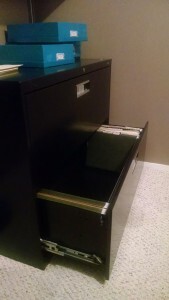 I cleared away over 25 years of accumulated junk paperwork that I no longer need to protect or make space for.